I'm already anticipating your first question: if the set is called the "Russian" suite, why is it in the royal vaults in Sweden? Even though the set is in Bernadotte hands today, its history begins in early nineteenth-century imperial Russia. In 1804, Grand Duchess Maria Pavlovna, one of the daughters of Tsar Paul I of Russia, married Carl Friedrich, the Hereditary Grand Duke of Saxe-Weimar-Eisenach. Maria Pavlovna was a granddaughter of Catherine the Great and the sister of various European rulers and consorts, including Tsar Nicholas I, Queen Catherine of Wurttemberg, and Queen Anna of the Netherlands. The marriage of the daughter of an emperor required important presents, and this pink topaz set was among them. Maria Pavlovna's father, Tsar Paul, presented her with the set as a wedding gift. 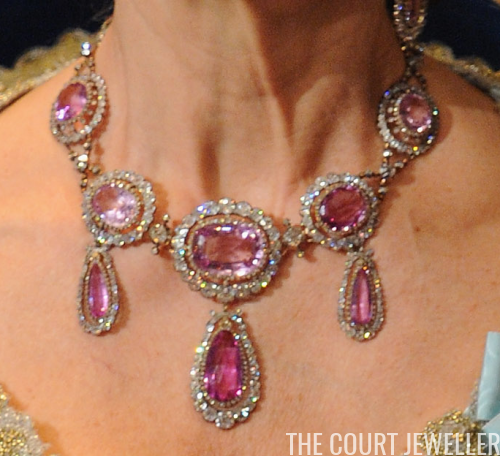 The large pink topazes are surrounded with glittering diamonds, and the set consists of four pieces: a large, impressive necklace, a small round brooch, and a larger, multi-stone brooch with a floral motif. Two of the pendants from the larger brooch can also be detached and worn as earrings. 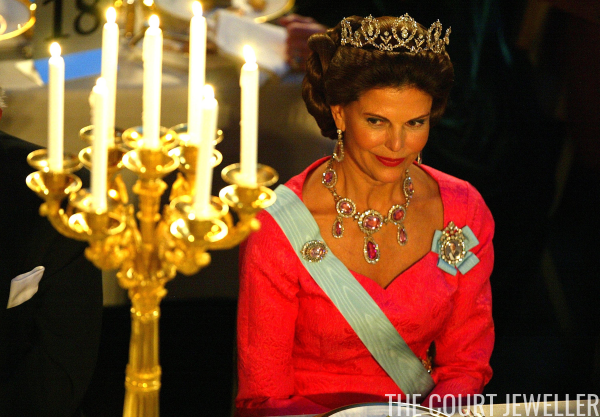 The set is often called a "demi-parure" because it lacks a tiara. 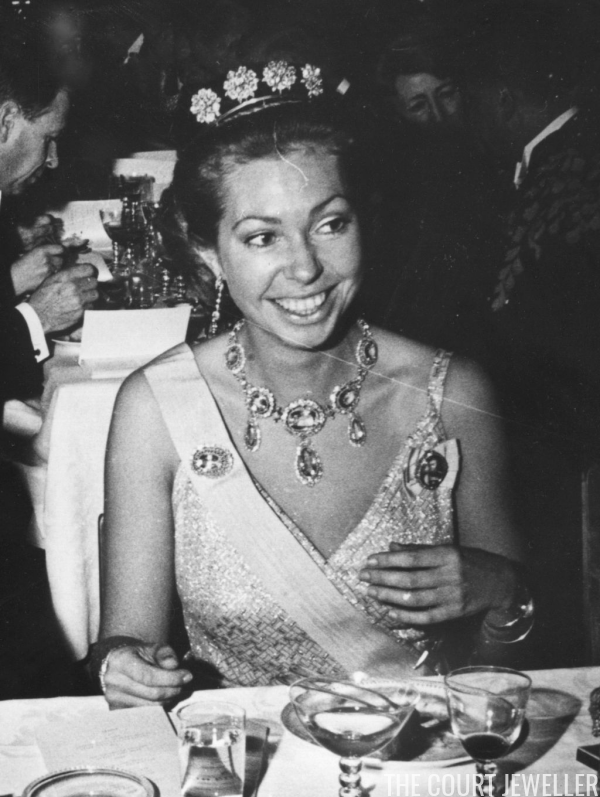 But although she did not make significant use of her mother's topazes, Victoria did an important thing that secured their future in Sweden: on her death, she bequeathed them to a jewelry foundation, which means they will stay in Swedish hands. Both queens of Sweden who have followed Victoria -- Queen Louise and Queen Silvia -- have made major use of the topazes, often wearing them with the enormous Braganza Tiara or the more delicate Connaught Diamond Tiara. Princess Sibylla, mother of the present Swedish king, also wore the topazes, as did the king's sister, Princess Christina. 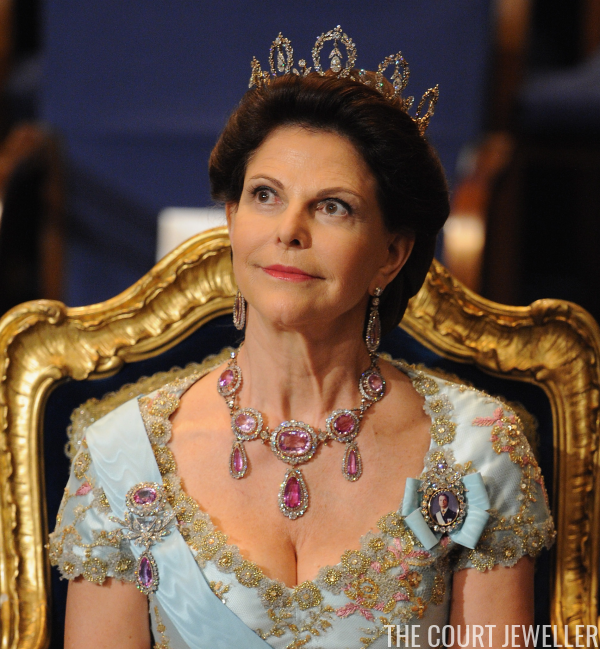 Queen Silvia selected the set for one of her first portraits as queen, pairing them with the Braganza Tiara. 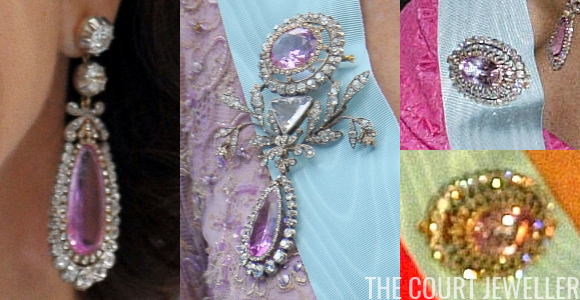 She's even worn the larger brooch from the set as a headpiece. Silvia has chosen the topazes for a number of important occasions since, including the wedding of her eldest daughter, Crown Princess Victoria, in 2010, more than two centuries after they were made.